The periodic table of elements also called longform of periodic table is a chart which arranges the elements in the increasing order of their atomic number in a useful and logical manner. The elements are arranged in groups and rows based on their properties. The periodic table is one of the most useful tools of chemistry and the other sciences. The study of periodic table starts in class 7 or 8 and its depth of study increases every year up to class 12. Hence, the study of periodic table is vital for every student to have a good knowledge of chemistry. There are several methods that teachers employ to teach the periodic table. 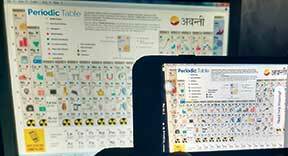 The Blippar app from Blippar India can become the newest way to introduce the periodic table to your students. The Blippar app brings you an interactive periodic table that is colourful, informative, and fun. The App is very user friendly and with the ubiquitous smart phones, installing and using the app shouldn’t be difficult. After downloading the app, a colourful longform of the modern periodic table in 18 groups and 7 periods with symbols of the elements, their atomic number, atomic weight and a picture depicting the uses of the elements is seen. Upon touching any element on the table, it opens to a screen showing its name and applications. Different colours and shapes are used to mention the nature of the elements, such as its metallic character, non-metallic nature, physical state, etc. There is no need to carry the periodic table chart or paper to memorize; since the phone is on one’s person always one needn’t wait for a specific time or place to learn. During travel, recess time in schools or colleges, in groups with friends or any time one can open the app to learn. Unlike the periodic table chart which is useful only to learn, the Blippar app helps us test our learning as well in the form of a quiz and games. The app is also the best way to learn the periodic table for visual and kinesthetic learners. 1. History – on clicking History, we get information about contributions of scientists from the 17th century onwards to the periodic table. 2. Quiz – The quiz can be played at three levels –easy, medium, and hard. It is a fun way to test one’s knowledge of the periodic table. One needs to fill in some details like name, class, school/college before one can start playing the quiz. 3. Play – This is a play-way method of learning the periodic table. After clicking on the play option, the periodic table opens with a few empty blocks, the symbols of a few elements are given at the bottom of the table. One has to click and drag the right symbol of the element to fill the empty spaces within one minute. This play helps one identify and learn the right positions of the elements in the table easily. The clear and user-friendly instructions given in the app with a fun way of learning, helps students and teachers acquire knowledge of the periodic table easily and gives scope to correct the solutions too. Valency of elements is essential to write formulae and students make errors in writing correct formulae. Showing valency along with the atomic number and atomic mass of elements, would be of great help to students. On clicking an element only one of its uses is shown, perhaps three or four uses will make it more informative. The periodic table is the basis for chemical reactions, additional features of writing chemical formulae and testing in the quiz can be informative and attractive. Dividing the table into groups and periods perhaps makes more sense as learning about the periodic table can move from the part to the whole. Note: The Blippar App is available on Android and iOS platforms. For more information about the app itself and how to use it, readers can write to Moumita Roy at moumita.roy@blippar.com. The reviewer is the Head of the Department for Science and also the CBSE co-ordinator in Delhi Public School, Nacharam, Hyderabad. She can be reached at sulekhanayani@gmail.com.